I picked this game up a few months ago and then got around to playing it a month later. There was a lot of hype and controversy around this game when it came out. I was interested in seeing how a sandbox world set in a prep school and the surrounding world around it would play out. I was pleasantly surprised and slightly addicted to the game. Bully: Scholarship Edition for the Xbox puts you in the role of Jimmy Hopkins, a brash youth thrust into the halls of Bullworth Academy. The object of the game is to survive school, dominate social peer groups, and get the ladies (or guys if that’s your fancy), just like real High School. You accomplish these goals by going to class, doing favors for your fellow students and avoiding or confronting other bullies. You are given the ability to intimidate or accommodate your fellow students and teachers which many of us lacked in real life. Jimmy also has an arsenal of items like stink bombs and a slingshot to aid him in his adventures. You even have a back alley bum to teach you special forces fighting techniques he picked up in the war. The classes are probably one of my favorite aspects of the game. They are a collection of mini-games which vary depending on the subject. Geography has you match names to countries on a map. English has you spell as many words as possible from a pool of letters. Math is a multiple choice math test. Biology has you dissect different creatures by tracing lines and clicking tools. There are a couple of pattern matching and quick time event classes too like chemistry, shop class and music. All of them have their share of challenges and fun getting progressively harder as you pass each class moving to the next level. Biology was one of my favorites in concept but challenging with the controller. Probably easier with a mouse on the PC or perhaps with a Wii wand. Favors for students and teachers are your standard fair of missions you find in games. Delivery, collect item and use object missions were the most common. Most of them had a time element to them. The thing that was done well was keeping them in the context of the game and using them to move the story forward. All the missions had a purpose and the rewards were usually worth while. Typical rewards were money, new items to use (like firecrackers) or a new girlfriend. Every season at Bullsworth was a storyline and advanced you through the social ranks. Each social group gained you access to a new girlfriend to win. You can be quite the player by the end of it all. Kissing girls gets you a boost to your health which is a nice bonus but not needed once you get the controls down. Most fights are easy to accomplish without worry of defeat. Still I found myself picking flowers and buying candy all the time to get the girls. There are ways to get certain male characters to kiss you as well which I guess was part of the controversy of the game but I never pursued that route in my play-through. Most romances in video games are novelties and have little substance in the game. Bully is no exception. Your seasonal advancement also opens up new areas of the school and the town surrounding it. Bully: Scholarship edition really gates you in where you can go and what you can do but gives you the sense of an open world. I realize this is a way to give a sense of advancement and achievement. Its a nice reward but I am hesitant to really say its a true sandbox if you are gated in where you can go. Its a small gripe and has no real bearing on my enjoyment of the game but is worth noting. Bully: Scholarship Edition gives you ample things to do and collect. You have a good variety of clothes to buy and earn to help Jimmy fit in with the different crowds. Jimmy even gets a skateboard and a bike to ride around on. These are handy since they help you not only accomplish certain mission goals but also get you around a lot faster. This handy because of one of my other complaints about the game. The other complaint of the game is the time of day and the window of time given for any activity. You are not working in realtime in this game nor should you be. However the clock is a little fast for you to accomplish much in this game in a given day. You wake up and have your first class almost immediately. Now you can skip class but then you are truant which makes doing anything on campus or in the town harder since you have truant officers after you. Since most classes are fun mini-games anyway you might as well go to class. After your first class you can maybe do one task if it is on campus. Then you have to rush to your next class or again be truant. After your second class you have time to do one or two more tasks before you are breaking curfew and then eventually just collapse of exhaustion or head to bed to sleep. Now there is no rush to finish missions and you can eventually complete all the classes so you have no more to do giving you more time to explore and do what you want with out penalty. Really the word penalty is false as well. Even if you get caught and sent to the principles office you just get access to more mini games like mowing the lawn or shoveling snow. These lead to more achievements. Not really a punishment. Sure they take all of your stuff but you eventually have plenty of money to buy it back or have your own chemistry kit to make the items like stink bombs as much as you want. I never really felt like getting caught was a punishment in the game or a setback. Only the hands of time were my bane. 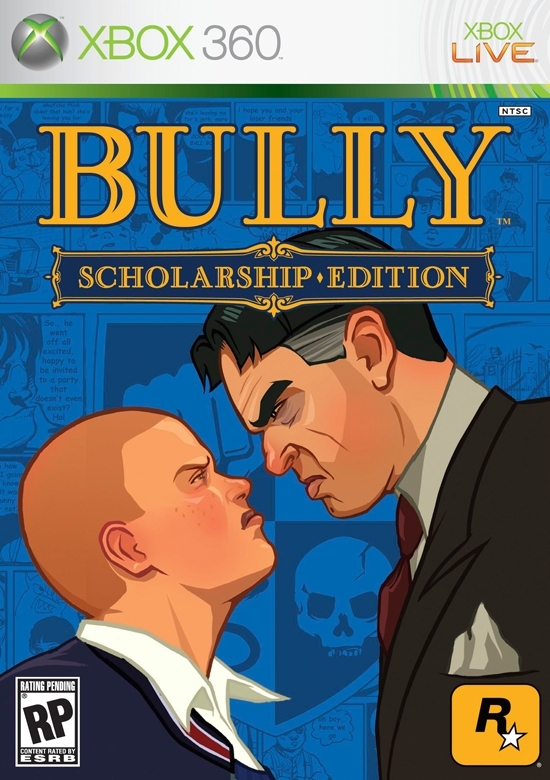 Bully: Scholarship Edition gets a four out of five stars from me. It had a decent story, fun mini-games and lots to do. The gated pseudo sandbox environment and short days took away from what could have been a perfect experience. Great review! I played the standard version when it came out and really enjoyed it. This is probably Rockstar’s least offensive game, though still in keeping with their “outlaw” attitude. Well, game with a story, anyways. I don’t suppose Table Tennis should count. Monday Morning Quarterback: Smackdown vs Raw 2010 Managing the Game: Do what you love and love what you do.